This granola is not intended to be eaten in huge quantities, rather as a generous spoonful or three over poached fruit or fresh berries, perhaps with yoghurt on the side, for a special breakfast or brunch. It also makes a delicious snack and lasts well in an airtight container, so it is worth making a good-sized batch. Preheat oven to 150°C. 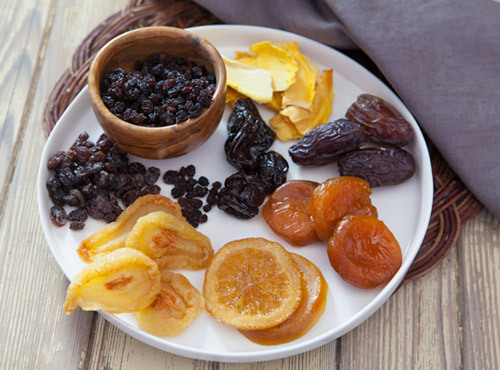 Using scissors, cut dried apricots into sixths and chop dates. Combine all fruit and set aside. In a separate bowl, combine nuts, rolled oats, bran flakes and wheatgerm. Heat oil and honey in a saucepan until simmering. Pour over nuts and grains and mix well, then tip into a baking dish. Press in so that mixture is no more than 3 cm deep. Bake for about 1 hour, stirring from time to time, until nuts and grains are thoroughly toasted and golden brown. Cool in baking dish, then mix in fruit. Break up and store in an airtight container.